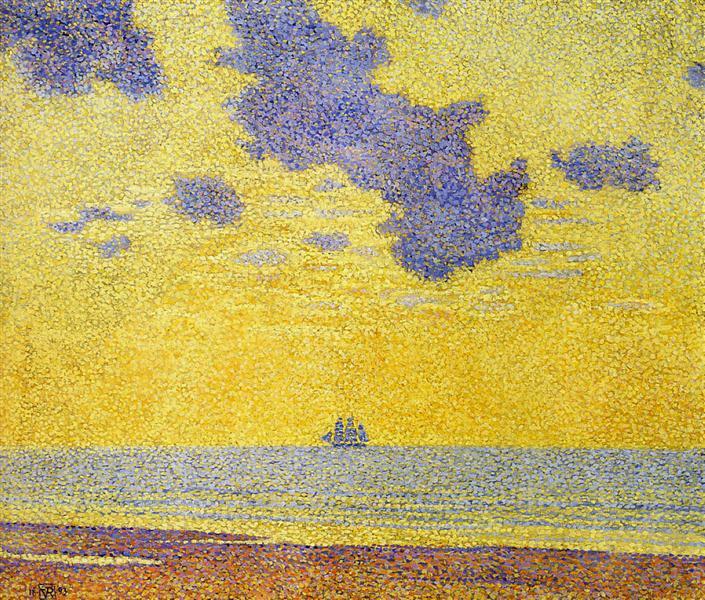 With a restricted palette made up mainly of blue-violet and yellow (a combination following Neo-Impressionist colour theory) van Rysselberghe constructs a stunningly beautiful and very simple composition with the sailing ship positioned dead centre within a tranquil sea. The low horizon gives the artist the chance to concentrate on the play of clouds set against a sky which has just seen the sun set. This image betrays the influence of Symbolism on the Neo-Impressionists – the artist strives to create a contemplative atmosphere – there is no narrative. The viewer constructs their own response to the vibrant, scintillating surface as the complementary points of colour play against one another.